The new GuidoMaggi "Columbus Circle" double buckle are a jem by the Italian design. 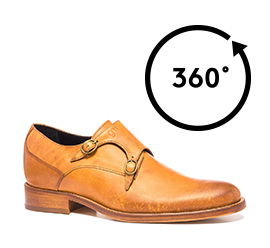 The unique tan cognac upper, in full grain Tuscany vegetable tanned leather, gives refinement and elegance. The outsole, midsole and insole, in real leather, are joined and sewn at sight according to the traditional craft method. The heel in real leather is with anti-slip rubber. It is possible to customize the shoes, by choosing the invisible and anatomic inner height insole between 2.4, 2.7 or 3.1 inches, depending on your style needs.